Base of Operations: Initially Middleton, later active across the U.S.A.
History: Frustrated at the crime plaguing his hometown of Middleton, U.S.A., a prominent citizen created an alter ego for himself who did not need to be restrained by society's laws when it came to punishing evil-doers. Disguised as a hobo called Chauncey Throttlebottom the Third, a.k.a. 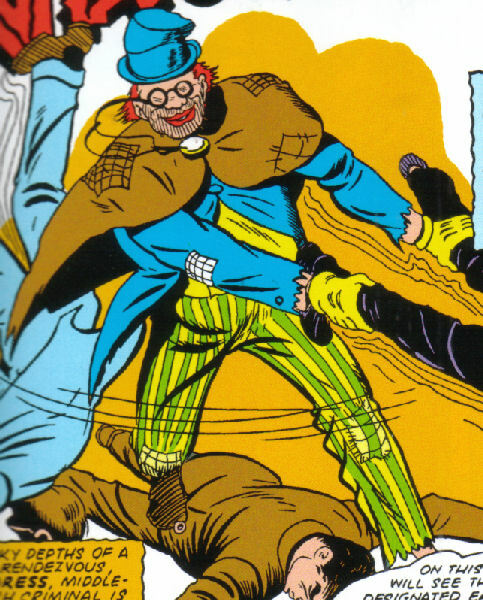 The Vagabond, he went out and fought crime. Eventually it appears his role-playing of a homeless person overtook his original personality, as he seemed to become a hobo for real. (Avengers/Invaders #12) Vagabond was amongst a number of heroes who battled Nazi supervillains. Comments: It was suggested in the Vagabond's first appearance that he was really either a police officer called Murphy, or an FBI agent called Walter Carstairs. 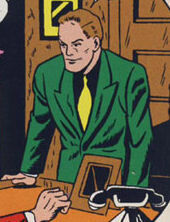 However a text story in U.S.A. Comics #2 confirms that he is Pat Murphy. In costume he only refers to himself using the Chauncey name - it is the text of the story that calls him the Vagabond. The character seemed to take his alter ego very seriously once in the role, not slipping from the persona for a second. Perhaps this is why in later appearances the crime fighting side of him abruptly vanished, and he was portrayed as genuinely being down and out. Maybe his mind snapped from the continuous strain of maintaining a second identity. Vagabond made his modern day return in Avengers/Invaders #11, where his legs (and only his legs) are visible amongst heroes murdered and pinned to a wall by the Red Skull; luckily this was a Cosmic Cube created altered timeline, and the heroes were restored come #12.